In 2010, after celebrating the 50th anniversary of CED, Dean Wolch approached a small group of dedicated and caring alumni and friends of CED to ask their help in advancing the strategic goals of the college through their professional expertise, counsel, and connections. The Dean’s Advisory Council — an evolution of the CED Alumni (CEDA) board of directors which had served the college since 1990 — has grown to a diverse group of 26 alumni and friends who act as close advisors to the dean and ambassadors of the college. Members of the Dean’s Advisory Council — which include such notable alumni as San Francisco Foundation CEO Fred Blackwell, Johnson Fain founders Scott Johnson and William Fain, SPUR Executive Director Gabriel Metcalf, Walt Disney Company Director of Health Management Barbara Wachsman, and SWA Group Chairman John Wong — represent a range of professions and geographies and comprise not only graduates from the three departments within CED, but also notable leaders from outside the college. The Council was originally chaired by Bob Lalanne and the current chair is Sylvia Kwan. Membership in the Dean’s Advisory Council is by invitation of the dean of the college. 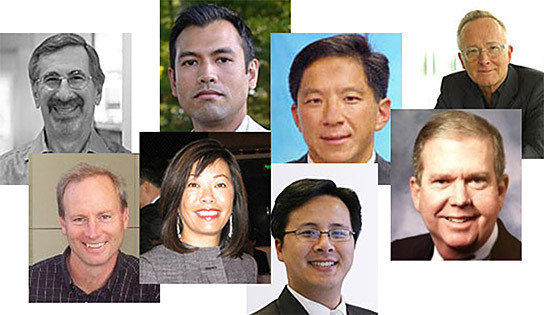 Advisory Council members (clockwise from left) Brian Dougherty, Lydia Tan, Ricardo Capretta, Vishaan Chakrabarti, William Fain, Gray B. Dougherty, Kofi Bonner, and James R. Crawford. While Advisory Council members pledge an annual contribution to the CED Annual Fund during their three-year term of service, their greater impact comes from bringing their professional expertise to help CED leadership shape activities, programs, and facility development; and inspiring others in the CED family to make contributions in support of these endeavors. Advisory Council members generously give their time and talent, often going above and beyond, with significant in-kind and pro-bono support to build the CED community, help students, and aid the dean in making improvements to Wurster Hall. Maintaining and nurturing the CED community is essential to the prosperity of the college. Members in New York and Los Angeles go out of their way to coordinate or host both intimate events and large-scale programs, allowing alumni outside the Bay Area to network and continue their relationship with CED. Providing professional internships within their firms and supporting internship programs is another endeavor where Council members are an invaluable resource. Internships programs, such as CED’s On-SITE, allow students to enhance their education with practical hands-on experience in firms while introducing these organizations to some of the brightest and most determined design students soon to enter the market. Advisory Council members also enrich the student experience by conveying their knowledge and professional expertise through accepting faculty invitations to speak at classes, participate in reviews, or by making the significant financial commitment to sponsor a studio course. 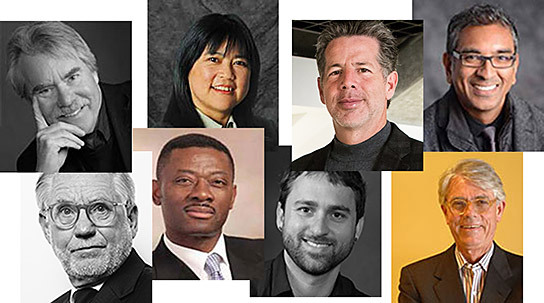 Advisory Council members (clockwise from left) David Friedman, Jhaelen Hernandez-Eli, Jackson Hseih, Scott Johnson, Tom Mead, Michael Lin, Sylvia P. Kwan, and Chris Kent. 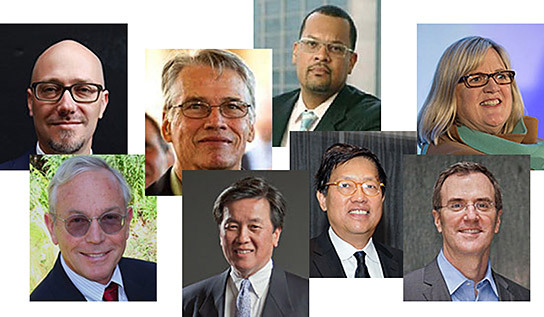 Advisory Council members (clockwise from left) Gabriel Metcalf, Michael Painter, Fred Blackwell, Barbara Wachsman, Paul Woolford, Joseph O. Wong, John Wong, and Judd Williams. Generous pro-bono and financial contributions by Advisory Council members ensure that Wurster Hall facilities meet the needs of current and future students and faculty. Members have played an important role in helping improve Wurster Hall — contributing to the Gallery, first and second-floor lobbies, Flex Studios, and the Digital Fabrication Lab which houses new digitally controlled equipment. The new Materials Store, where CED students can purchase fabrication supplies, was also realized through the generous financial support of a Council member. One of the most essential contributions the Advisory Council makes is in supporting the dean in strategic planning. Members played an active role in developing the 2012 Strategic Plan, supporting the implementation of a road map that will be the touchstone for planning and fundraising for the next 5 to 10 years. 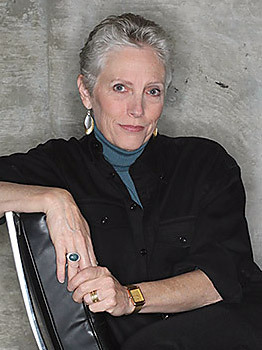 In addition to their fundraising support for several key initiatives built into the strategic plan such as Flex Studios — the campaign to update Wurster’s studios with multiple platforms for creativity, research, and design collaboration — the Dean’s Advisory Council is also called upon to encourage others to give to the CED Annual Fund. Over the last several years, this group’s commitment to the CED Fund has made a significant difference to the college. An essential resource as CED faces critical issues that challenge today’s public educational institutions, the CED Fund provides the college with crucial support for a variety of activities, including educational programming and opportunities such as lectures, exhibits, and international studios; the research efforts of our outstanding junior faculty; and CED’s Career Services, an office dedicated to helping our students launch their professional careers.  Contributors of $1000 or more to the CED Fund become members of the Wurster Society. For the past three decades, members of the Wurster Society have provided leadership gifts to meet high-priority needs and to allow CED to capitalize on unexpected opportunities. Ricardo L. Capretta, President, Capretta Properties Inc.